This white pedestal plate came from Marshalls -- it had a red with white polka-dotted ribbon wound around it, but that was easy enough to change. 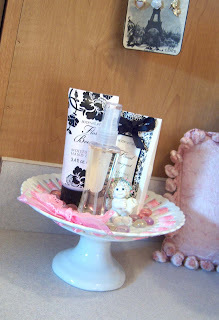 I added some pink/clear "rocks" and lotion/perfume/bath salts that coordinated with my decor and a little Dreamsicle (from a collection I started over 12 years ago) to the top of it. 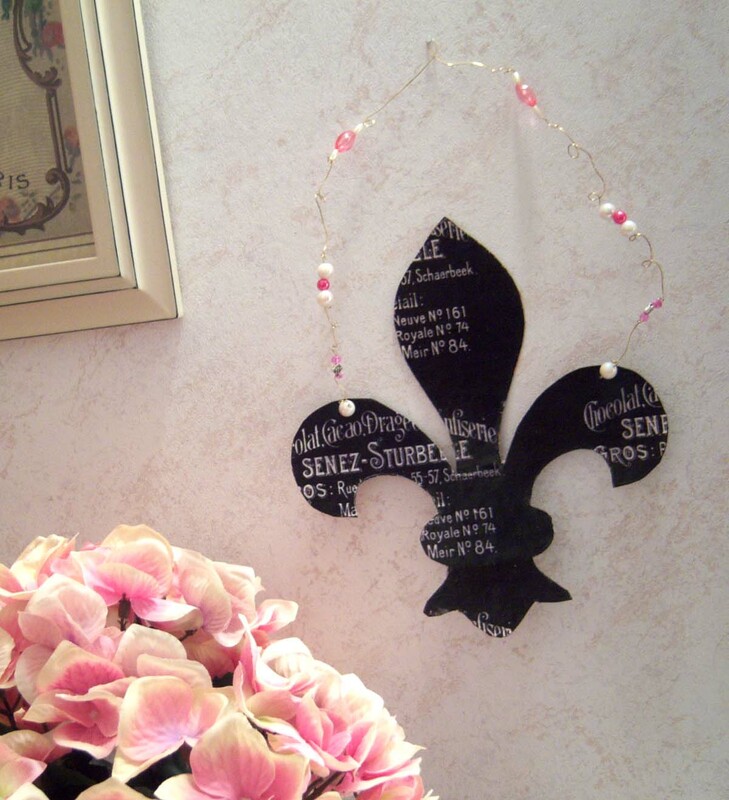 In my search for Paris themed bathrooms on-line a wooden fleur-de-lis decoration caught my eye. Since I had already seen some fleur-de-lis artwork at the Graphics Fairy that I liked it wasn't hard to mimic it with very minimal cost. I enlarged it to the size I wanted and printed it on white cardstock. 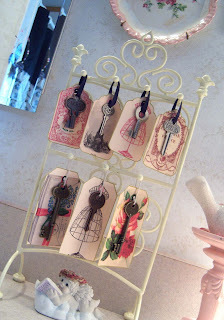 I then cut it out and adhered to a recycled cereal box and decoupaged over it. The wire hanger with pretty beads was a lot of fun to make and added some color to the arrangement. I love your "Paris" inspired bathroom! IT looks awesome! Your pedestal and "hanger thing" both turned out great! Love all the tags! So pretty!! 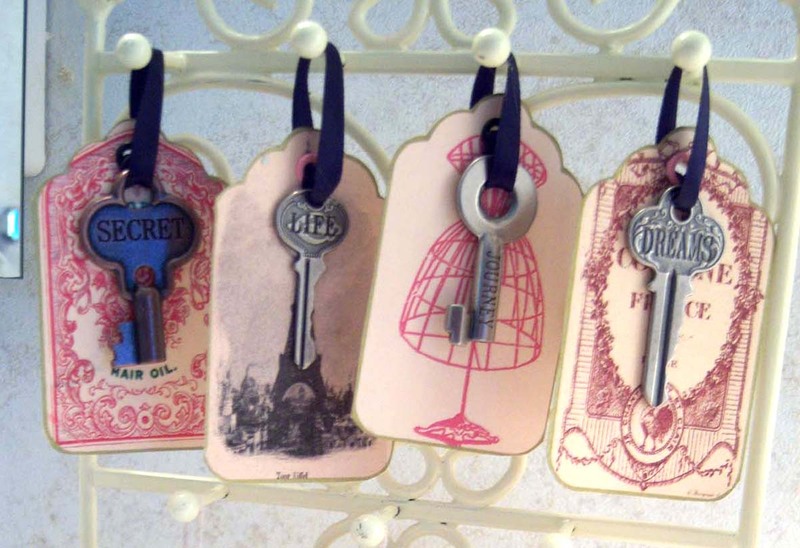 I am always in love with what you're doing with the decor in your bathroom. It's just so gorgeous! I'm jealous :). I love pedestal dishes, and yours is gorgeous. 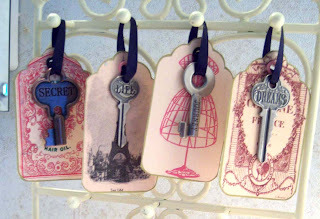 My favorite element, though, is that display of keys! 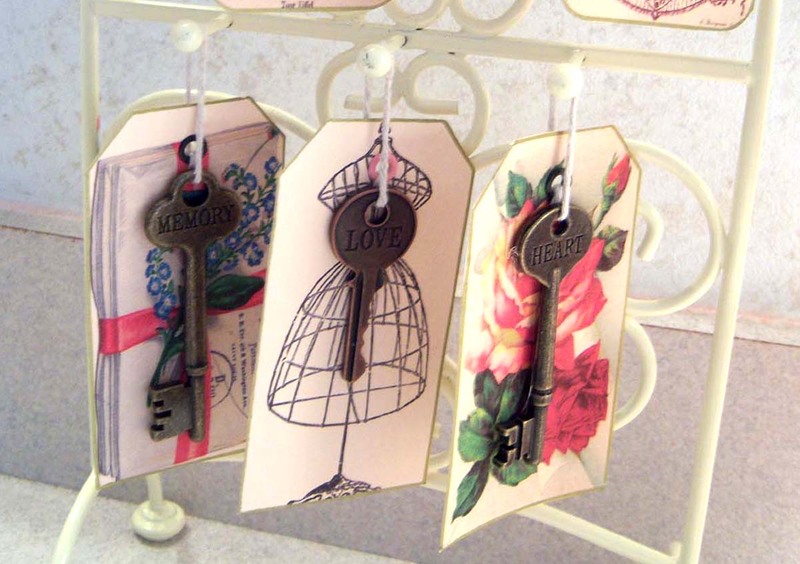 Your tags are gorgeous and the perfect accent for the keys.